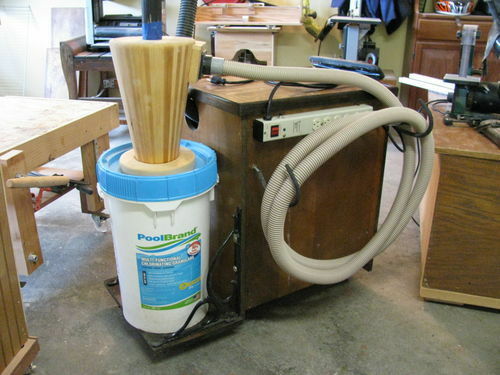 The SDD replaces a “Frankenvac” HF through a Thein separator to a plastic barrel, using Rockler quick-connects to each tool. I replaced the HF impeller with the Rikon, and what a difference! I am blessed to be able to just vent outside, so fine filtration is not a concern. 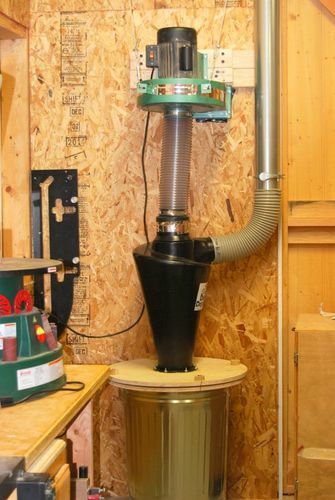 The assembled collection corner is amazingly quiet, and has quite a lot ( don’t have the ability to measure airflow) of suction – even on the far end where the SawStop lives. I read of some complaints about assembly and quality issues, but experienced none with mine. I ordered through Menards, it came in quick, picked up at the store – easy. 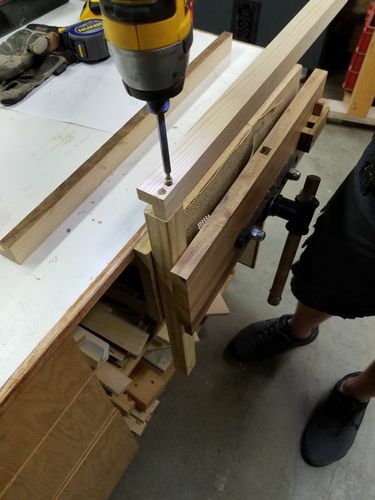 I still want to figure out a way to lift the SDD/top lid of the chip barrel, perhaps a couple of handles with a cam action – just needed to get this up and running. It has been up a couple of weeks now, and I couldn’t be happier. Not sure why the bottom image is rotated on it’s side, but I can’t seem to fix it. sorry! Wow! Your post comes at the perfect time. I am planning to do the same. I would be curious to see what percentage of dust you are venting outside. I’m planning to vent mine into the flower bed where no one will notice a little dust. How much vibration are you seeing/hearing/feeling with the motor hard-mounted? Any advice now that you have yours completed? I can’t speak to the amount of dust actually going out, but during testing prior to the outside tube being installed, we used the floor sweep and closely looked at the output, and nothing was visible – I know, superfines wouldn’t be visible, but again, lack of proper test equipment prevented serious testing. 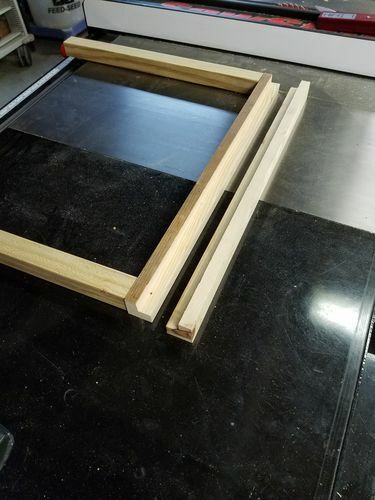 I know that the Thein separator seemed to keep things very clean in the shop, and the SSD appears to be even more efficient, so I’m very pleased with the result. I’m also running two Hunter HEPA filters on a timer that run every night for several hours. I found no vibration with the pretty solid mount, and the new impeller seems to be balanced perfectly. 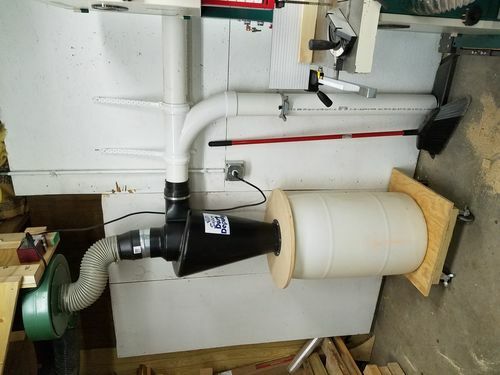 I am planning to move the motor assembly a little toward the wall to reduce the kink in the up-pipe, will update when complete. What’s the difference between the HF and Rikon impellers? 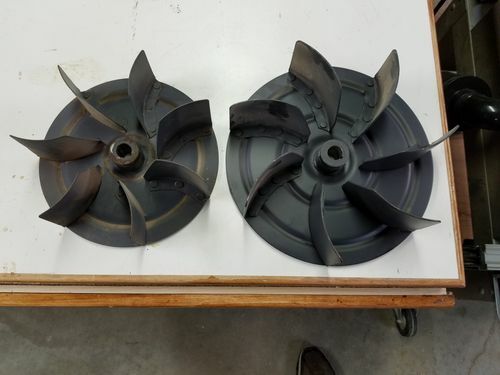 Have any pics comparing the impellers? What’s the Rikon p/n, where did you get it, and how much $? would someone who replaced the impeller please post a project with detailed steps and pictures of how you did it? 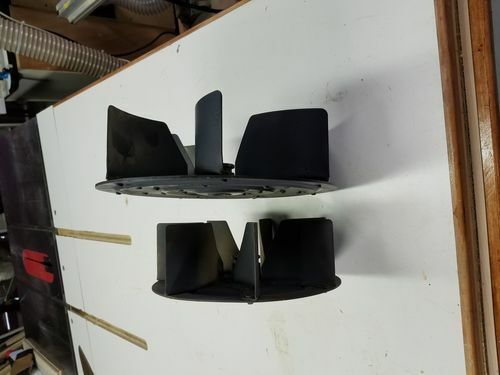 The difference between the impellers is size, (the Rikon has a larger diameter and the fins bend “backwards” to the rotation) the HF impeller has a set screw, and the Rikon does not. The part number is 60-200; call 877-884-5167 M-F, 8-5 EST and ask for the Model 60 part number 200 Impeller. It cost $120.00 including tax and shipping. As to the replacement, simply remove all two hundred and forty-twelve screws from the impeller faceplate, remove the bolt holding the impeller to the shaft, and loosen the setscrew. I had to use penetrating oil and a fair amount of force from a gear puller to get it started off, but once broken free, came right off. Clean, slide the Rikon impeller over the shaft and key, replace the bolt ( I used some LocTite just to be on the safe side) and you are almost done. Now for some controversy – I cut off the grid in the input connector… my thoughts were: since this is going to be in the “top-hat” configuration i.e., on it’s side, with the impeller (input) facing down), the wood chips and etc that is sucked in will have a much harder time lifting the seven to twelve inches from the cyclone to the impeller to do any harm, and small metal bits (screws, etc) would have a really hard time going up – this has proven true so far, but let me add this disclaimer: YMMV – your mileage may vary; if you cut the grid off and it eats a particularly tough piece of wood, it’s on you. I should have taken side-by-side comparison pictures, and apologize, but I just had to TRY IT! Very nice and cool shop! My setup is very similar except I did not swap out the impeller. There were “internet rumors” that Rikon insisted on having a serial number for one of their DCs before they would ship the impeller, any truth to that? 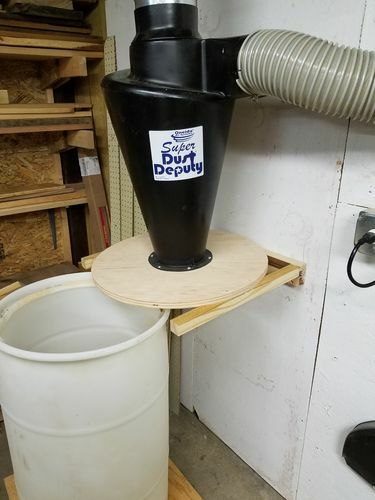 I used a trash can for the dust bin, and attached the lid and SDD to the wall so it suspends the can about 1in off the floor. Loosen 4 bolts and the can drops when I empty it. Rikon parts did not ask me for a serial number, in fact when I initially emailed them for pricing, the responder told me the impeller was backordered due to it being used for a competitor’s DC and gave me the phone number for ordering. 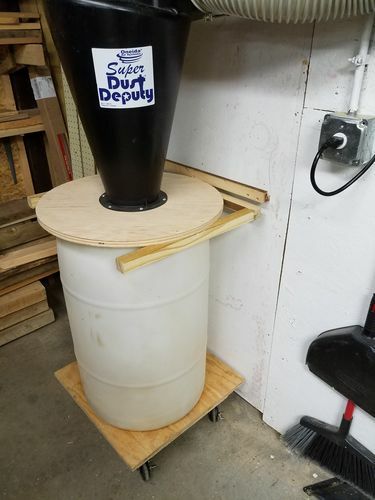 I have giving a fair amount of thought to how the barrel can be removed, it now sits on a mobile base and I’m leaning towards a couple of handles to lift the lid (may have to use a longer hose to allow compression) so some way to prop the handles in the “up” position will be needed. I have YouTubed and seen several alternatives… just gotta get to it! 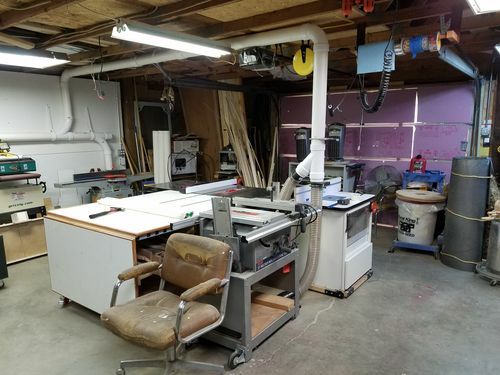 How about sharing some shots of your shop and setup? htl – thanks for righting the picture – did you rotate it off-post and reinsert? Rich you could mount the top price to the wall and make the base like a mobile saw base. 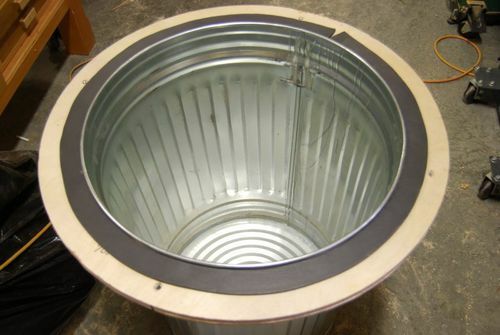 So when you put the barrel and base under the cap then push the mobile base peddle or lever down it would raise the base/barrel up to the top section. 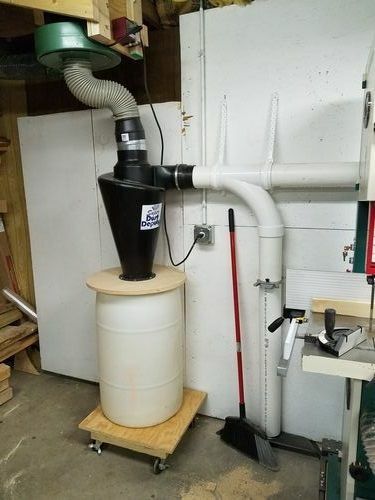 Just a idea since it’s hard piped in or a screw base for the barrel like a old doctors chair a couple spins and the barrel make contact with the top and a couple spins and it’s free to move out. Rikon parts did not ask me for a serial number, in fact when I initially emailed them for pricing, the responder told me the impeller was backordered due to it being used for a competitor s DC and gave me the phone number for ordering. 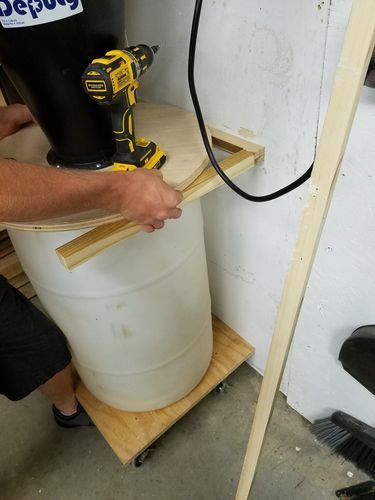 I have giving a fair amount of thought to how the barrel can be removed, it now sits on a mobile base and I m leaning towards a couple of handles to lift the lid (may have to use a longer hose to allow compression) so some way to prop the handles in the “up” position will be needed. I have YouTubed and seen several alternatives… just gotta get to it! Rich thanks for the info, I will order one next week. I don’t want to hijack your review but here are a couple of pics. 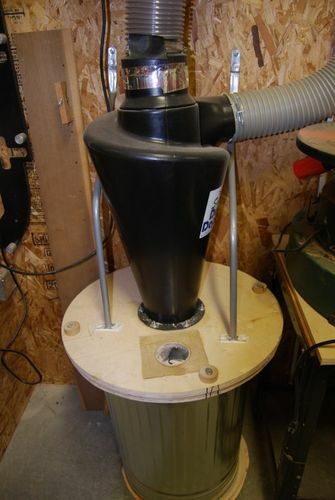 I made a slip ring to fit under the rim of the can, and epoxied it to the can and added weather stripping and 4 t-nuts. I grooved the lid to fit over the rim and made 4 bolts to attached the lid and SDD. I bent 2 of the HF bag support rods to fit and bolted them to the lid and wall. The rods hold the can about 1” off the floor when empty and allows the can to “sag” as it is getting full. It is really easy to loosen the bolts and empty the can. Like you I exhaust outside and I am really pleased with how well the SDD does its job. As for the relative size of the impellers, we took the time to disassemble the fan unit to extract the Rikon impeller – pictures attached. NOTE: The bolt holding the impeller to the shaft is LEFT THREAD!...... I put arrows on the washer to remind me. Hope they still show up next time I have to disassemble this unit! dabcan, I used the 5” hose that came with the HF DC as far as I can recall, it just happened to fit from the SSD to the first log curve 90 degree adapter outside – with a little persuasion! You could also use a 4” pipe connector – the OD is way bigger than the ID, and the gray hose is a tight fit. Rich that looks like an elegant solution. I am ordering an impeller tomorrow. I will save the picture to my download files then open it in paint flip it then save, your now ready to upload it. I love cyclones so glad to help. Not as big but she gets er done.